This file is intended to be a basic introduction to Australian public telephones or as they are now called "payphones". DPMS (The payphone management system). Originally introduced in the early 1960's by Victa Telecommunications. These phones were later purchased or leased from Telstra. The red phone is almost totally phased out of service and at the time of writing are very scarce. The red phone requires coins to be deposited before it will allow you to make any calls. Directory assistance 013 and 000 etc also require a coin before you can place a call. With these numbers the coin will be returned after the call. There are two main types of redphone the tall version and the squat version. The tall version is by far the most common. It also has two obvious variants a 20c only version and a 10c & 20c version. The tall versions appear to have been manufacured in Japan. The redphone weighs over 10kg with an empty coin tin. It is very solidly constructed. The redphone has three locks. The back RHS lock is for the payphone owner to make "uncharged" calls. The front RHS lock is for the coin safe. The coin safe contains a small black plastic container which holds the coins. The LHS lock allows the top to be removed from the telephone. Three connections are made between the top half of the phone and the base. These are for the dial. The hookswitch mechanism of the redphone has an interesting built in delay. This is to prevent hookswitch dialling. 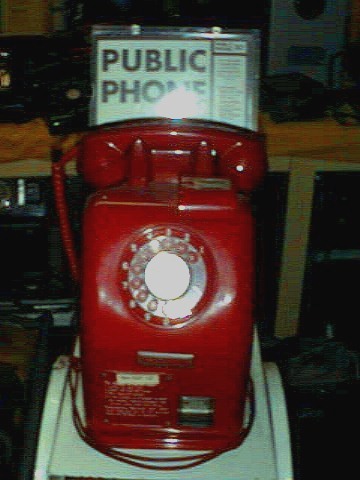 The redphone has a conventional electro-mechanical bell. A circuit diagram is usually pasted inside the case of a redphone. One interesting adjustment is that a PCB key is inserted to allow the phone to be used on SxS or ARK exchanges. These phones appear to have been quite widely used in Japan. These phones were able to be purchased from Telstra. They can be purchased second hand for around $400 (check the Trading Post etc). The whole top half of the phone can be removed by using a key, this allows access to the electronics and coin mechanism. These phones have a very similar coin mechanism to the other Telstra phones, the coin mechanism is manufactured by Anritsu in Japan. The phones themselves were assembled by Alcatel/STC in their Alexandria factory (Botany road). The phones have a small LCD display which shows the credits remaining. To improve the security of the coinbox some phones have an additional metal plate that covers the coinbox area. This is usually secured with a padlock. The Gold Phone can be either pulse or tone dialing. Most appear to be pulse dial only. 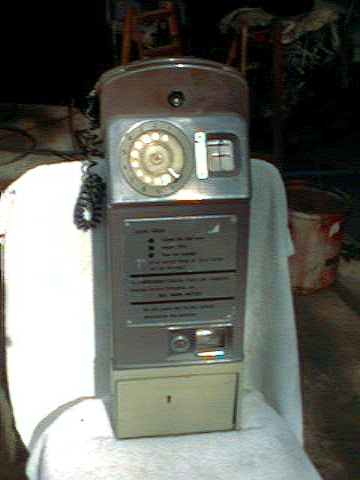 The bluephone has the ability to bar calls to certain numbers. They have features such as displaying the number of calls that have been made when the coin box is emptied. The construction is lightweight on these phones, they are intended to be used in supervised locations only. The phone is opened using a bi-lock key. There is a hinge on the LHS of the phone and the front of the phone swings open to reveal the coin mechanism. These phones can be switched into owner mode etc if the key is used. Bluephones are manufactured by GPT. 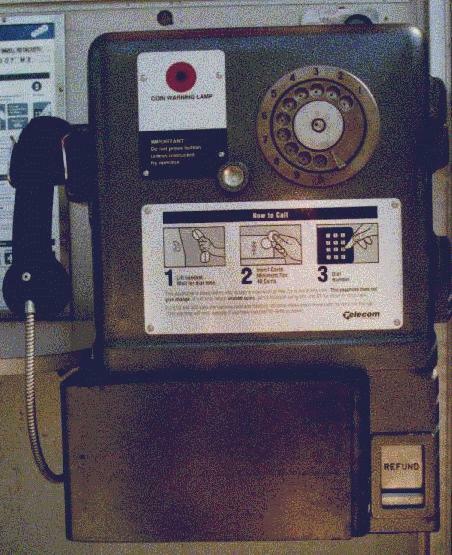 The RS Components catalogue used to show some payphones very similar to the blue phone. BT in the UK use phones very similar to the bluephones. See the link at the end of this document for the UK Payphone page. (d)GREEN PHONE or CT3 (stands for coin telephone number three). (Introduced in the early 1970's). Most of these phones were originally green although the few remaining phones are often a silver/grey colour. These phones were manufactured by Anritsu of Japan. The green phone was found in almost every suburb in Australia. Introduced in the early 1970's. It is a solid metal phone which has been the target of many a coin thief. In the mid 1980's these phones were having their coin boxes stolen at a terrible rate. Telstra has made several modifications to the phones to reduce the incidence of vandalism and theft. A device called the Kirk Safe has been fitted to many phones to stop people with ramset guns, drills etc from removing the coin box. The Kirk safe is a dramatic improvement in the "armour" of the coin box. The Kirk safe was named after Alan Kirk a Telecom worker who invented them. The Kirk safe was introduced in 1986. Prior to the introduction of the Kirk safe phone coin tins were being stolen regularly. An article in the "Sydney Morning Herald"17/10/1987 page 1 by Jenny Chater describes a particular phone box in Fairfield East, NSW. The box mentioned had its coin safe stolen twice between Dec 1984 and Jul 1st 1986 (Prior to the fitting of the Kirk safe). In some months in 1986 there were up to 1,200 robbery attempts on phones claims the Sydney Morning Herald. The coin head (where the coins are inserted) has been modified from the original sloping head to an upright metal plate. This has been done to stop people pouring soft drink into the phone as the drink corrodes the circuit boards and it is very costly to repair the phone. Sparkers or Clickers (the peizo electric spark guns from ovens, heaters etc) were often use on green phones to trick a free call. This no longer works on many phones as Telstra has modified the phones. 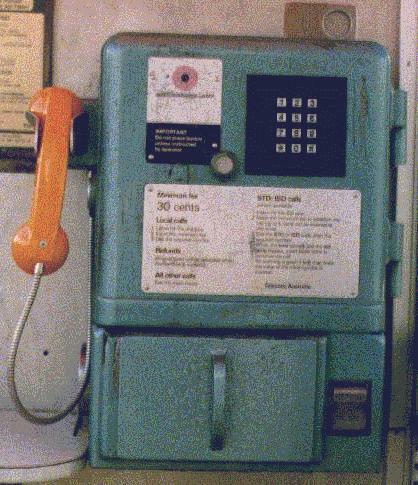 The green phone like the CT3(c) has two keyholes the top one opens the door which has the dial and bell mounted on it. When the door is opened the coin mechanism is located directly in front of you. This swings out on its hinges to expose the main circuit board. The phone line enters the phone from the top and is connected at a small terminal block on the top of the PCB. The bottom key hole is used to open the coin box. Inside the coin box is the coin tin. The original lime green plastic dials were replaced on most phones with a very nice stainless steel dial. This reduced dial vandalism. Recently a modification has been made by Telstra to give the phones a push button keypad and tone dialling. A black painted metal plate with a keypad is fitted where the old dial used to be. The keypad doesn't have any special keys only 0-9,* and #. To reduce the number of handsets that were being damaged a reinforced cord was installed on most CT3. This cord is now seen on most outdoor payphones. The reinforced handset cord has been very successful in preventing the handset from being stolen or the cord damaged. At one time criminals stuffed paper etc into the coin return chutes to catch returned coins. This was largely eliminated by modifying the coin return chute to prevent access. As at the time of writing it is rare to see any of the green phones. Most have been replaced by card compatible phones. The CT3 can be immediately recognised by the red coin warning lamp on the left hand front of the phone. Below and to the right of it is a silver button with the instructions "IMPORTANT Do not press button unless intstructed by operator". Below is a picture of a very unusual varuiant of the CT3. It is designed to use a loudpeaker! Note the early use of pushbuttons. The coiled cord for the handset is also unusual compared to the armoured cords used today. The coin refund compartment also has the unusual cup modification which "catches" the coins. These phones are very interesting. The phones require a EFTPOS/Credit or Telstra calling card to be swiped through the card reader before the call is placed. These phones have two keypads, one for dialling the other for banking account information such as PIN and account type. They have two phone lines connected to them. One is for voice the other for data. The data line is used to verify the PIN number and account details of the person placing the call. This code will not work if the phone is out of order and is displaying the message "service calls only" on the display screen. The credit phone has a series of numbers programmed into it that are regarded as "service calls" these numbers include 013, 1100, 000 etc. When "confused" these phones will display the message "System Fault". I believe the Creditphone was made by Alcatel/STC. The CT3c is readily identified by the grey/silver color (although blue phones are found at railway stations in NSW),keypad and orange backlit LCD. It has evolved from the green phones and incorporates high-tech electronics. The metal case of the CT3c is from recycled greenphones. The case is simply cleaned re-painted and has a new door (with added bulge) fitted. The phones can be either pulse or tone dialling this can be changed at any time by moving a jumper connector on the pcb inside the door. The CT3c like the greenphone is held on its mounting bracket or booth by six bolts. Four pass through the back wall of the upper part of the phone and two through the back wall of the coin box. The main board on the back wall of the phone is the Network board. It has an EPROM type chip on it which contains the software used to run the phone. The CT3c appears to "lock up" when piezoelectric sparkers are used to try and gain free calls, when this happens the phone will display the message "replace handset" even when the handset is on hook. The phone will not report itself out of order when it is "locked up". A technician is required to reset the phone when this occurs. The modem board is in the door along with the card reader and the LCD. Faults can be diagnosed in the phone by checking its error codes for specific areas in the phone which are believed to be faulty. If no faults/errors are present the phone will display a string of 0's for the particular item being checked. Power is delivered to the CT3c at 21V AC. The power supplies often used for CT3c phones can deliver 21V at 2A. In many of the phone booths such as the "Heritage" design the power is delivered by a transformer which is also used for powering the fluro light. These phones will accept a maximum of five coins at any one time and will only refund unused coins. The phones will accept 10,20,50 cent and $1 coins. This phone closely resembles the Anritsu FX7003 IC Card Payphone. The CP9 is another sophisticated phone. It has many useful features such as the volume control button, redial, memory, and the follow on button. The CP9 accepts only Telstra phonecards. When the phone is opened you will see a series of vertically mounted boards plugged into sockets on the back of the phone. The card reader is encased in the same black plastic housing as the reader in the CT3c. A small container holds the punched holes from the phonecards. When this container is removed the phone will report via DPMS that it's missing. The CP9 is also designed for use with DPMS. The CP9 also uses a 21V AC power supply. A variation of the CP9 has a keyboard fitted for TTY use by deaf callers. The TTY compatible phones can often be found in major cities. A small stainless draw beneath the phone contains the keyboard. 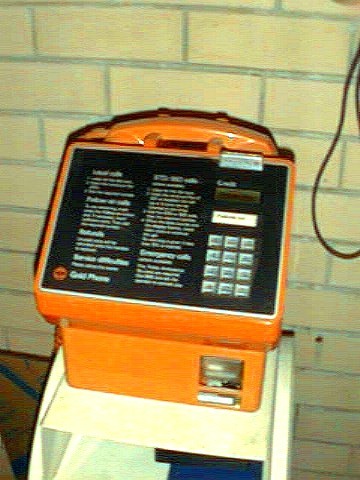 There are several brands of payphones which can be purchased from companies other than Telstra. The phones often allow the dialling of 19123 etc and so the callback number can be easily found. These phones often ask for a button to be pressed when the called party answers. This allows you to speak to the called party. 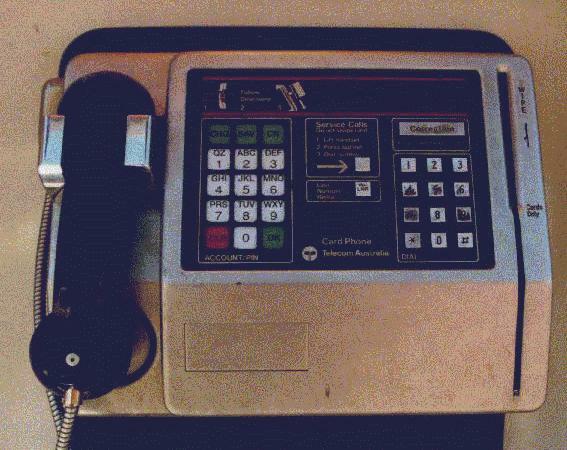 Tandy and many other companies used to sell these payphones, the phones are I believe much less durable and less secure than the Telstra phones and many appear to be poorly designed and prone to coin jams. Fax/payphones are seen at some airports in Australia. These have the callback number printed on them. Recently a new type of privately owned payphone has appeared. They resemble the US payphones (sighted in Chatswood NSW). The only phone of this type that I have sighted was unfortunately out of order. These phones are made to slightly different specifications for different countries. Amper state that similar phones are installed in Malaysia,China, Singapore and other countries. These phones were introduced first in Adelaide then in Perth, Brisbane,Sydney etc. When a phonecard is inserted into the phone a pin automatically locks it in place. This prevents the card from being removed mid call. These phones are manufactured by a Spanish company called Amper. They have very close ties to Siemens. Siemens manufactures the SLE4436E chip which is used in the Telstra disposable phonecards. The payphones have the Automatic fault reporting facilities found in the CT3/CP9 series of payphones. This was called DPMS but may now be called something else. The payhones all around Australia all now apparently dial a central number to report faults. These phones do not contain a bell or ringer. This means that the operator on 1234 cannot connect you to one of these phones. An article (with picture) appeared in the West Australian 27/12/97 describing how these new phones were/are being targeted by vandals/criminals. This vandalism has now been halted/prevented with the addition of added protection to the coin box/vault. On February 4th 1999 the Australian announced (on page 1 ! )that Telstra had begun replacing most of its 34,000 new smartcard phones with "retro-fitted" Smart Payphones. According to the article "the new units were quickly found to be less durable than their predecessors, ill suited to extremes in Australian weather-such as heavy rainfall and heat-and vulnerable to vandals and theft". The article indicates that the manufacturer will retrofit the phones to make them more durable. In the article it is stated that "extensive modifications would involve changes to the face of the phone-the new units have a shiny rather than matt finish-to make them more weather and corrosion resistant." I have seen these new retrofitted payphones at Adelaide airport (Feb '99). They look VERY similar to the original MPP except that they have a very shiny case. *A phone with additional protection to the coin safe was seen in Leederville WA. Many phones now have a domed coin head section which replaced the original coin head. This modification appears to be an attempt to fortify the head area and also reduce the incidence of rubbish being introduced into the phone. The MPP have also been sighted housed in the CT3(c) cases. I have seen one of these phones in Manly NSW and another one in Brunswick VIC. The slot for the smartcard is at the front of the phone pointing towards the user. The phone pictured seen in Brunswick VIC has the Kirk safe. The ID number ended in Z2. The familiar orange colouring of the cosmetic panels on the CT3(c) is not present on the "Z2" phone photographed. Another point to note is the handset is of the new type not that found on the CT3(c). The most common reasons I have seen for the phones being out of service is that the coin tin has been stolen or that the coin slot has been smashed apart or jammed. One very positive feature of the new phones is that they accept 5,10,20,50cent and $1 and $2 coins! These phones are new type which incorporates a large LCD screen and touch sensitive display. The phone only takes smartcards. I have only seen these phones at the Adelaide airport however I believe that that they may be located in other areas as well. The phones are physically very large. There is no dial/keypad on these phones. All dialing is carried out using the touch sensitive display. The screen also has various options to send e-mail, query white and yellow pages, and various other services. A small slit towards the bottom of the case looks like it is designed to provide hardcopy printouts of screen information. (3) DPMS(Distributed Payphone Management System) The idea of having payphones reporting their faults automatically is not new,it is known by different names in different countries. Anritsu have an equivalent of DPMS called PDMS (Payphone Data Management System). 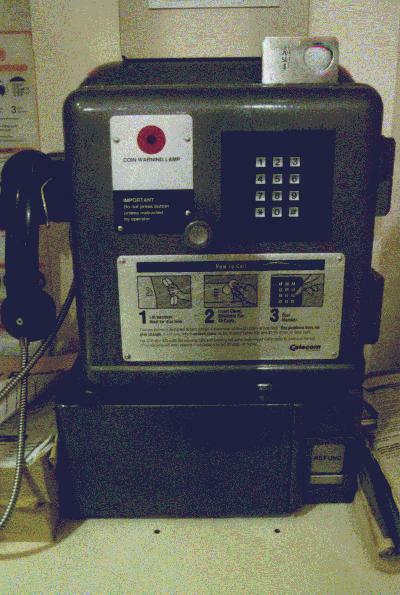 The payphones (CT3c and CP9 and Smartcard X1/X2) contain a computer modem which enables the phones to report their faults and call statistics. The modem can also be dialled by Telstra to remotely transmit information to the phone. When the CT3c are reporting themselves they will display the message on the orange LCD display "Out of Service" and then "Automatic servicing in progress". If you know the phone number of a CT3c or CP9 you will be able to call it and after seven rings hear the modem answer with a single "whistle". The modem also enables information to be transmitted to the phone to be displayed on the LCD. A typical use for this is advertising. COIN TINS The coin tins are located inside the coin box. On the Green phone and the CT3(c) the coin tin is of the self locking type. This means that as it is removed from the phone the two slots will automatically close. The idea being to prevent pilfering of coins by staff. A key is used to unlock and "reset" the coin tin mechanism. There are two slots on these tins though only one is used for coins, the other was used on an earlier design of phone. The coin tins are usually a silvery grey colour of unpainted metal. Many people wonder if there is a "code" behind the cabinet number that will reveal the payphone number. There isn't currently any such code. Australia uses a very similar phonecard system as is used in Japan. This system uses magnetic stripes on a plastic card. Fraud has arisen when people have rewritten the information from a $100 card onto that of a $2 or $5 card. -See "Australian" Newspaper 4/8/93 Page 4 -Also "Tele Mirror" 3/8/93 Page 3 Apparently this fraud first occurred in Japan. This fraud the newspapers stated also occurred in Adelaide SA. Cards were widely available in $5,$10,$20,$50 and $100 amounts, although there have been special issues of cards with "unusual" values such as $1.50. These cards are more collectors items than regular issue. The small punched holes don't seem to play any role in the deduction of value from the card. A phone with no hole punch will still deduct value from a phonecard (it is possible to have a $50 card with only 30c remaining and no holes punched by a faulty phone). It is also possible for a phonecard to be damaged by the phone. The card reader will accidentally damage the magnetic strip on the card. These cards are believed to utilise the Siemens SLE4436E chip. Commonly known as the Eurochip. An excellent article appeared in the Nov 1997 issue of ETI (a UK electronics magazine) regarding these chips. The article outlined how to make a simple circuit which would enable much of the phonecard information to be read (in binary form). These Siemens chip cards are secure. They contain a cryptographic security system using challenge and response authentication. There was an article in "Wired" magazine which claimed that the "Eurochip"(tm) cards were being reloaded by criminals in Europe. Another reloadable phonecard will also be released. The reloadable cards are based on the "Chipper" system. It has been reported in the media that the reloadable cards were being trialled in the Adelaide CBD in Dec 1998. If the reloadable cards prove popular they will become more widely available. Here is an excellent site with information about all sorts of 'chip' based phonecards. There have been many different payphones used in Australia over the years. They are well described by Jim Bateman in his book "The History of the Telephone in NSW". Working backwards here is some very introductory information on these phones. According to Jim Batemans book less than 1000 of these phones were made. The CT2 allowed local calls only. Apparently it was a widely vandalised phone. The CT1 was heavily modified to cope with vandalism. The CT1apparently had a modification to prevent "free" calls. This modification consisted of an oscillator activated after line reversal to generate an annoying tone on the line. The idea being that it would discourage fraudulant use of the phone. The CT1 was replaced in the mid 1970's by the CT3. 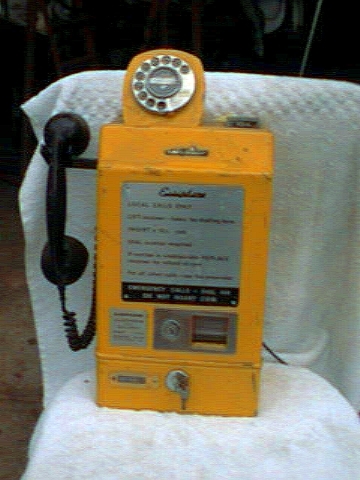 The Easiphone is as can be seen above one of the most colourful phones used in Australia. It arrived in Australia in the early 1960's and was marketed by a Sydney company called Elliot Automation. There were several different colour schemes used on these phones. The photo in Jim Batemans book shows one with a different dial mount and cash draw colour. This phone appears on page 64 of Jim Batemans book. The phones I have seen have been painted with grey hammertone type paint. The door with the dial swings open to reveal the coin mechanism. 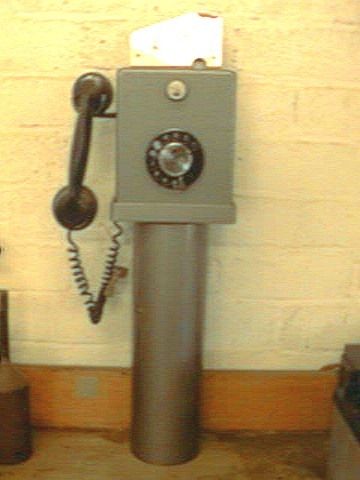 The Sydney workshop version was a reinforced phone designed to withstand atempts at coin theft. Coins are placed in the top where they roll down a chute to the coin mechanism. There is no coin refund chute. I plan to have more photographs of each and every payphone mentioned and an increased emphasis on some of the older payphones. The next photos added should be the CT3(c), Bluephone (tm), and CP9. "History of the Telephone in NSW" By Jim Bateman. This book has payphones upto and inclusng the CT3. I understand that this excellent book has recently been re-published. I have seen ads in the back of the Australasian Telephone Collectors Society magazine for the reprint. I am always interested in learning more about payphones. Please e-mail if you can help with any corrections or can provide information which would improve this web page. -I Don't work for Telstra,Optus, Vodafone, Siemens, Anritsu, Alcatel etc. My interest in payphones is purely from a hobby/collector perspective. -Telstra is a tradename of Telstra Corporation Limited Anritsu is a tradename of Anritsu Corp. Goldphone,Bluephone,Redphone are tradenames registered by Telstra Corporation Limited. -This document may NOT be reproduced without my permission. -If you feel I have revealed any information about payphones which shouldn't be publically available please e-mail me and I will remove the offending information.